Your home will sparkle for Christmas when you make these simple Styrofoam* Snowflake Ornaments, glittering with gold and silver. 1. Insert wooden skewer in foam ball and use as handle while painting. Paint ball your choice of gold or silver. Insert skewer in foam block while paint dries, or, place skewer in cup. 2. Cut chenille stems to varying lengths according to your design; bend and form pipe cleaners to create snowflake designs. Models used 3″ – 4″ stems. 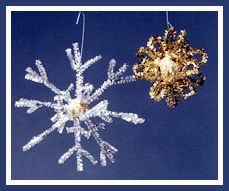 The stems on the golden snowflake were curved in half to form a loop. For the silver snowflake, a 2″ chenille stem was folded in half and twisted around a 4″ stem, 1″ from the end. 3. The chenille stems are attached to the ball using chenille “staples”. Form 3/4″ pieces of chenille stems into a u-shape. Place end of chenille stem on ball, place chenille staple over stem, and insert chenille staple into ball. 4. To hang, bend chenille stem to form a hook’ glue and insert end into ball.